Love from the Kitchen: Love Mail? But Not Junk Mail? I love getting mail. I think I told you that. Not bills... but mostly our bills are electronic now. And definitely not junk mail. And then this morning on the news I heard a story about how much spam email costs. People get really upset about spam. But those same people are not upset about junk mail (snail mail spam really) showing up in their mailbox day after day. I must say, I do enjoy the occasional catalog, but I get stacks of catalogs, mailings, credit card applications, coupons, etc. every day. 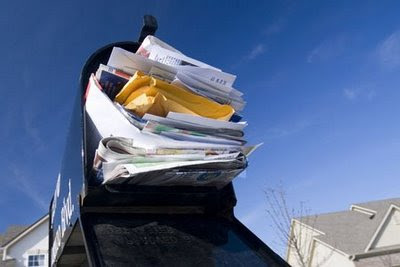 I used to take my mail directly from my mailbox and deposit most of it into the recycling bin. I thought you might like to know how we have fixed our junk mail problem. We signed up for proquo.com's free service just before Christmas. About 2 months after that, our junk mail became virtually non-existent! Now, if I see mail in my mailbox, it is most likely fun! Proquo shows you have to stop junk mail you do not want and keep those mailings you would like to keep. For the free (!!) service, you will need to print and mail pre-populated letters to the companies that manage the marketing lists. For $17.95 per year, they will do it for you. But, if you are looking for some fun mail, be sure to check out this post!